Barclays Capital affirmed on Tuesday their “overweight” rating on shares of Apple Inc. (APPL), currently the second most valuable co. in the U.S.
Barclays analyst Ben A. Reitzes wrote in a research note to investors that his firm continues to believe Apple is the best growth play in IT hardware segment. Reitzes set a new price target of $385 from $340 for the Cupertino, Calif. – based tech giant — that’s as much as 31% upside from Apple’s closing pps on Monday of $294.07 — and emphasized the fact that Apple has prospects for significant organic revenue growth for several more years. MW: “Even at this market cap [Apple] is the best growth play in the IT-hardware segment, with prospects for significant double-digit organic revenue growth for several more years,” the analyst wrote. Apple is currently the second most valuable company in the US by market cap with a total of almost $272 billion. Exxon (XOM) has a market capitalization of $327 billion. 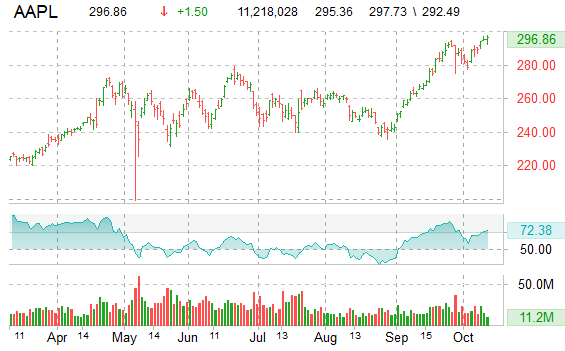 Apple share action: Up $1.48, or 0.50 percent, to $296.84 in morning trading Tuesday.